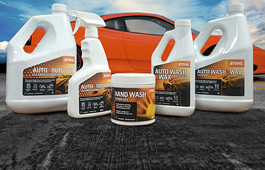 Clean better with STIHL’s new range of cleaning products. Australian made and 100% biodegradable, STIHL cleaning products deliver better results and are less harmful to the environment. The range includes an Auto Wash &Wax that removes dirt and grime fast and a powerful Auto & Outdoor Cleaner Degreaser that easily removes heavy-duty grease and grime. Both cleaners driver better results when used with STIHL’s range of high pressure cleaners. And when you’ve finished cleaning there’s our new Hand Wash Gel that’s tough on dirt but gentle on your skin.